After ten years of accumulating stuff, I am in the middle of packing up our belongings and moving them out before we begin a major house renovation. It’s a pain that I am experiencing as I write this article. But, while moving a home can be a hassle, it isn’t as complicated as a digital content migration. That said, both types of moves can be made easier while also minimizing unexpected surprises—with careful content migration planning. Each migration is unique. Size is an obvious difference—the bigger the project, the greater the effort required. From a migration perspective, the variance between content types dramatically impacts the amount of effort required. There are two ways to quickly—and radically—decrease the amount of effort required during a content migration: move some of the content (deleting unneeded content or deciding not to migrate some existing content) or move it all (then clean it up later). Of course, ease of migration shouldn’t be our only concern. Content migration planning should focus on producing results that help us meet our business objectives. Starting with the quality discussion will prevent us from doing whatever is easiest to do. 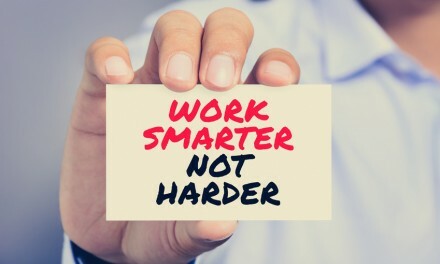 One of the reasons to start content migration planning early is that doing so allows us to determine the appropriate amount of work (and rework) the migration will require. By thinking through the effort—with our desired quality goal in mind—we may decide on an approach that requires less effort, but helps us achieve our aims. It’s important to recognize that the decisions we make about quality will impact other aspects of our content migration project. Boxing up—and moving—personal belongings to a new house can be frustrating, but it isn’t all that difficult. Consider what’s involved in moving a box of books from the living room in one house to the living room of another. Put your books in boxes. Label them (living room books). Seal them up. Arrange to have them delivered to the new house. Once the box is delivered, put it in the living room. Open and unpack it. Place the books where they look best. It’s pretty straightforward. Content is different. It requires an additional level of effort. We have to determine if the legacy content we want to move from our old website will fit nicely into our new one. Let’s say we have a set of product descriptions on our legacy website, and we want to use them on our new site. To make them work in their new home, we may need to rewrite and restructure them. To make that happen, we’ll need to unpack the boxes (make changes to the content) during migration. We box up content during a migration primarily to help us with planning. But, boxing provides additional value during a content migration. For instance, if we decide not to migrate some content to the new system, we can put that content in a virtual box and forget about it until later. By putting it into a box, we can examine the implications of our decisions on the new site in an organized fashion. Are there hyperlinks in the content we are migrating that point to legacy content we don’t plan to migrate? How will we handle those issues? Organizing content into virtual boxes also helps us assign and prioritize tasks, and streamline overarching migration efforts. We can assign virtual boxes of content to teams dedicated to unpacking that content and acting upon it. 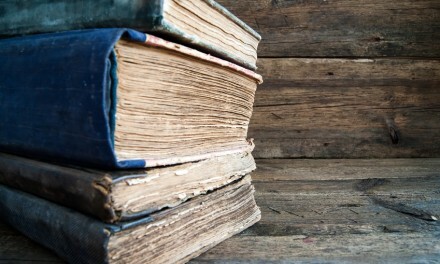 How much content we can box up and tackle at once depends on a variety of factors. Sometimes, we can handle an entire box of content without much difficulty. For instance, content that supports a product or service we no longer offer for sale. 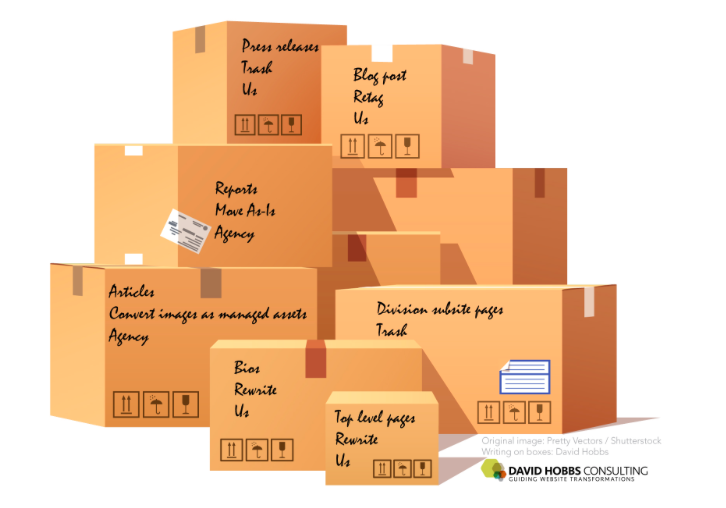 When we don’t plan to migrate content, we can put it in a box and toss it out. Or when we know that a type of content will remain in the legacy system (and therefore, is not part of the migration effort), we can box it up and ignore it. More often than not, however, content migration projects involve making changes to legacy content, so it will fit nicely into the new environment. In these cases, we need to open the boxes to make needed changes. Technical changes and editorial changes often overlap (e.g. 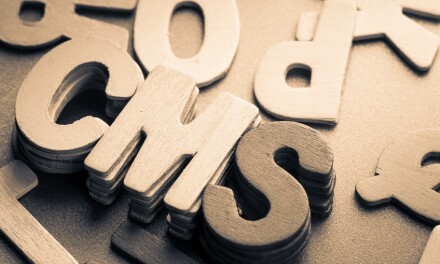 will we migrate all content automatically? or will some manual intervention be required? ), while some changes belong to only one of those categories. Moving content to the new system is a technical issue. Rewriting product content is an editorial concern. See also: What can be automated and what must be manual? Migration projects are never perfect. Neither are their plans, despite the well-intentioned efforts of planners. Migrations are complicated. They involve moving parts and a host of dependencies. That said, there are things we can do to minimize surprises and increase quality. Assume we started our content migration project with a discussion about the quality levels we need to achieve our business goals. Once we have our quality goals in mind, we need to estimate the level of effort—and resources—required. Because quality is more of a continuum than a binary decision, this helps drive useful conversations about an acceptable level of quality. These conversations sometimes result in acknowledging that we’ll need more resources. Other times these discussions will help us determine if our quality requirements are set too high. Content migrations are imperfect by nature. 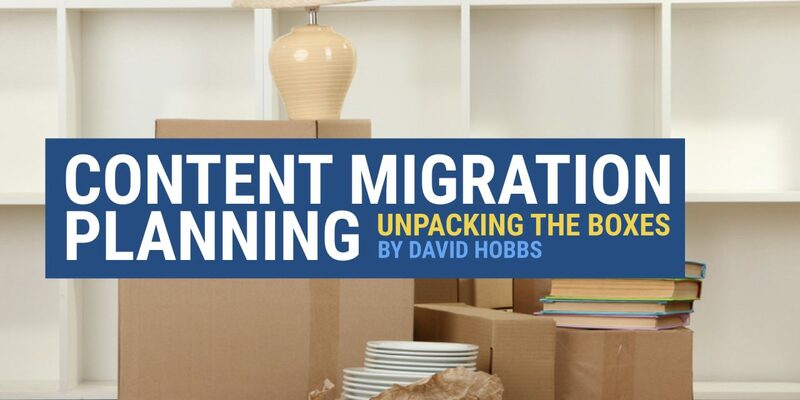 Careful planning is required to migrate content efficiently and effectively. Planning helps us prioritize our efforts and focus on the most important parts of the migration. For example, it may be more important to rewrite 50 product descriptions than to optimize 1,000 existing blog posts. Prioritizing allows us to focus on the most important tasks—the ones with the biggest return on investment—first. 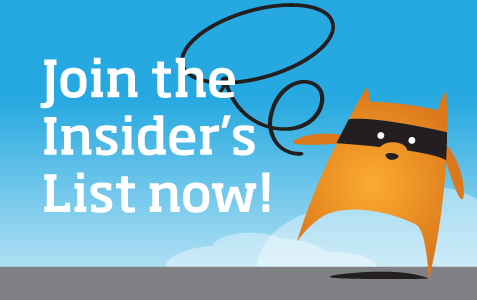 Most content migration projects mistakenly focus on tackling the low-hanging fruit— the easy stuff —but that’s a mistake. It’s always better to focus on how we will achieve our overall vision, with planning and prioritization (the harder items) the focus of our work; doing so allows us to prepare for unexpected surprises. When obstacles present themselves, we’ll focus on solving high-value content challenges instead of wasting time addressing problems with less-valuable content. Another way of dealing with imperfection is to start migrating—using actual content—as early as possible. Conduct a formal content inventory designed capture details about our content—what we have, what we don’t, where it lives—in order to help us make sound decisions. Although content creators and managers have deep insight into the content they produce, they are unlikely to be able to document content dependencies and relationships without the details provided in an inventory. Get Boxing (And Be Ready To Unbox)! Don’t fall into the trap of assuming it’s necessary to process and migrate each piece of content one-by-one. And, don’t assume there’s an ‘automagic’ way to migrate content without some manual intervention. Think about the goal of the effort. Then figure out how the best way to get there. And finally, consider how to “box” content; grouping it into batches that can be treated similarly during the move. When planning, look at how much effort is needed to move each box—and determine whether the effort is worth the benefit. Determine the best way to “unbox” content when it needs improvement or alterations before migration. 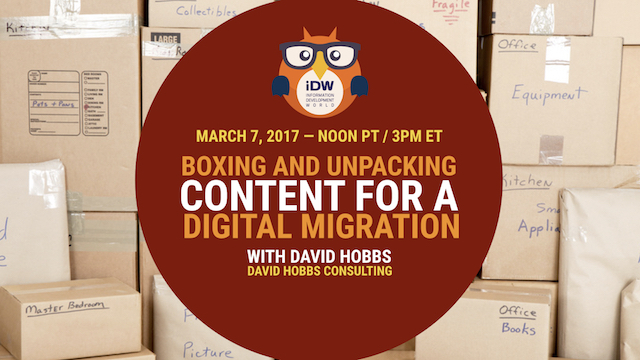 Plan to attend this free, one-hour webinar entitled Boxing and Unpacking Content for a Digital Migration, March 7, 2017, at 12 Noon PT as part of The Content Wrangler’s Virtual Summit on Advanced Practices in Content Management. Come prepared to learn — and to ask questions.